Here I am sitting in New York, the world’s greatest city, such a magnificent city, but my heart is always hankering after Vrindavan… I should be very happy to return to my Vrindavan, that sacred place… If I go and sit down in Vrindavan, that will be very good for my personal consciousness. I shall be very comfortable there, and I will have no anxiety, nothing of the sort. Vraja Mandal Bhoomi extends for about eighty-four kosas on this planet Earth. 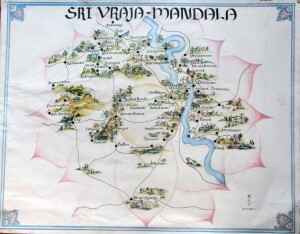 In other words, Vraja Mandal Bhoomi, also known as Vraja Bhoomi or Mathura Mandal or Vrindavan Dham or simply Vrindavan, covers an area of 1453 square miles (2325 square Km) and stretches from Agra in the South to Banchari in the North. The Puranas state, “Vrajanti gavau yasminnati vrajau”, which means that the land where the cows, cowherd men, cowherd boys and cowherd girls wander is known as Vraja. Vraja particularly denotes the land where the Supreme Person Shri Krishna performs His pastimes. 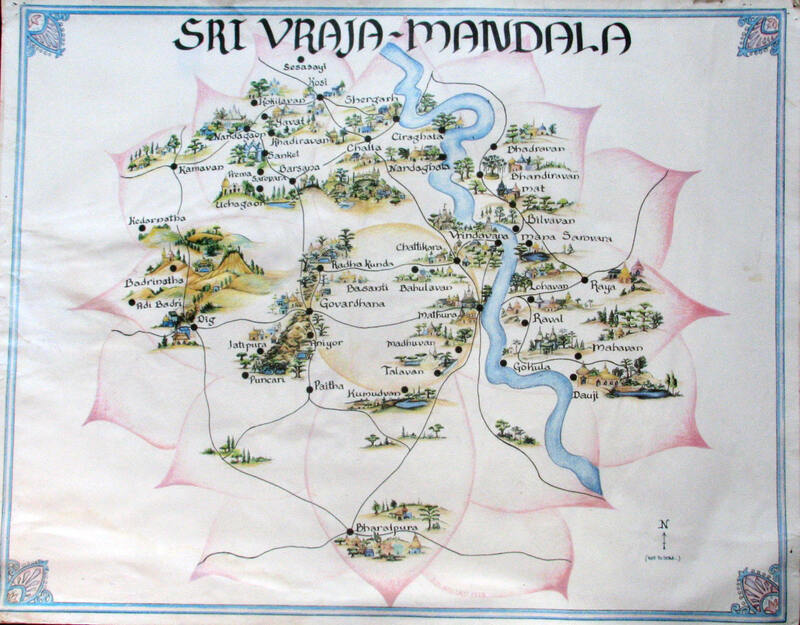 Vraja Bhoomi is made up of 12 beautiful forests and several other sub-forests with river Yamuna meandering through the entire land in its course. One of these forests is called Vrindavan. The Vrindavan town which contains many of the important temples and pastime places of Shri Krishna is also in this forest. This Vraja Mandal although appearing to be a part of this world is not destroyed at the time of universal destruction. In fact, this Vraja Bhoomi is a manifestation of Goloka Vrindavan, the eternal abode of Lord Shri Krishna in the spiritual sky, in this material world. Only once in a day of Lord Brahma, i.e. once in 4.32 billion solar years, does the Supreme Personality of Godhead Shri Krishna appears on this planet in His original form of Shyamasundar and Vraja Bhoomi is the holy place where Lord Shri Krishna appears and performs His sweet pastimes. 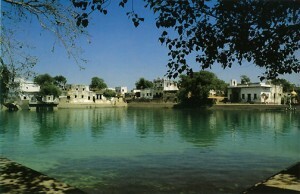 It is said that Vrindavan is Chintamani Dham, i.e. the abode of the Lord made of wish fulfilling touchstones. 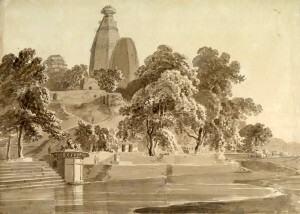 However it is not possible to perceive the actual Vrindavan Dham, as described in the scriptures, with our conditioned material vision. Vrindavan may externally appear to be just like an ordinary town or village and one may see sewage running in the street, hogs bathing in that sewage and walking around, but behind all of this the Lord is performing His unlimited pastimes. 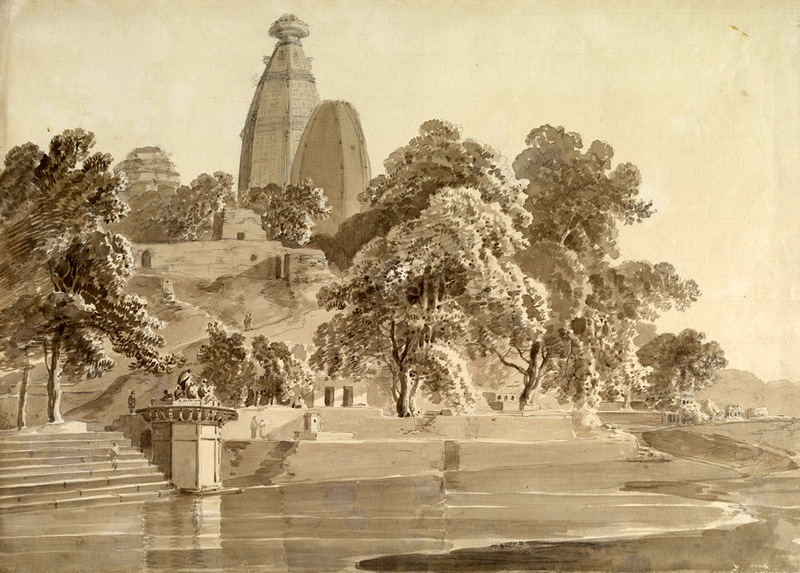 There is a thin veil of the curtain of Yogamaya which covers our vision from seeing Vrindavan. 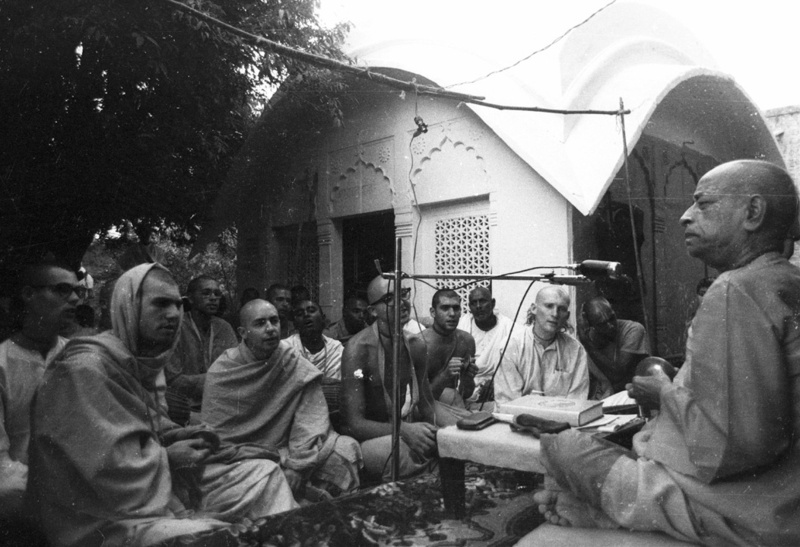 Vrindavan can only be seen by humbly and faithfully hearing from the pure devotees of the Lord. The great personalities who have completely purified their hearts can see the divine pastimes of Shri Shri Radha Shyamsundar continuously taking place in Vrindavan. 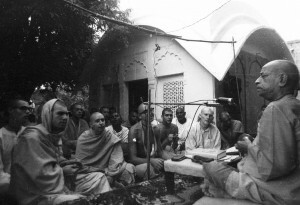 Therefore, one should visit Vrindavan in the holy association of the exalted devotees of the Lord and hear from them submissively about the name, fame, form and pastimes of the Lord. Then, when Krishna is pleased with our sincerity, the holy Dham will be revealed to us.